(740/13) 670-678 Eddy Street; Hotel Revere (1911), Burbank Hotel, Elk Hotel (1923). Stores and rooming house with ninety-eight rooms and thirty-six baths, one store occupied as glazing works by 1923. 4B stories; brick structure; arcaded top story, keystones, galvanized iron cornice; three-part vertical composition; Renaissance/Baroque ornamentation; vestibule: paneled walls and ceiling, entry through arch order; lobby: paneled wainscoting; signs: neon blade sign “Elk Hotel”. Alterations: security gate, storefronts. Original owner: Harris Shemanski. Architect: Ross and Burgren. 1907. 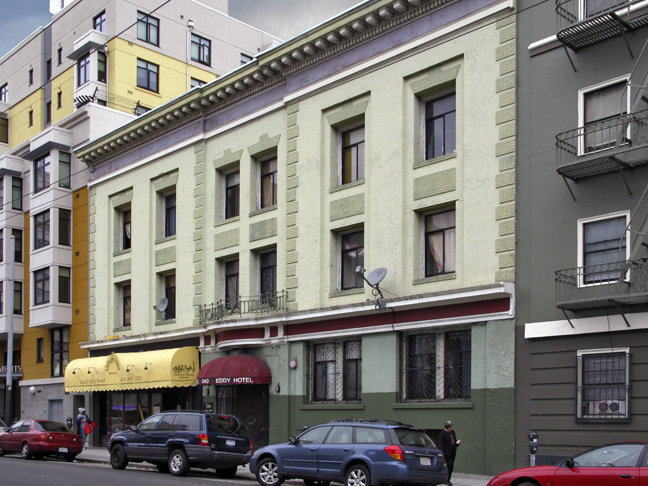 (740/10) 640-646 Eddy Street; Adeline Hotel Apartments, Olympic Apartments, Eddy Hotel. Rooming house with eighty rooms and twelve baths. 3B stories; brick structure; decorative brickwork quoins, flat arches, and keystones, galvanized iron cornice; two-part vertical composition; Renaissance/Baroque ornamentation; vestibule: terrazzo steps and tile landings, marble wainscoting, oval ceiling molding, leaded glass transom; lobby: pilaster order; storefront: display windows with transoms. Alterations: security gate and grilles, aluminum windows. Original owner: Adeline Hasshagen, widow. Architect: Arthur T. Ehrenpfort. 1907.